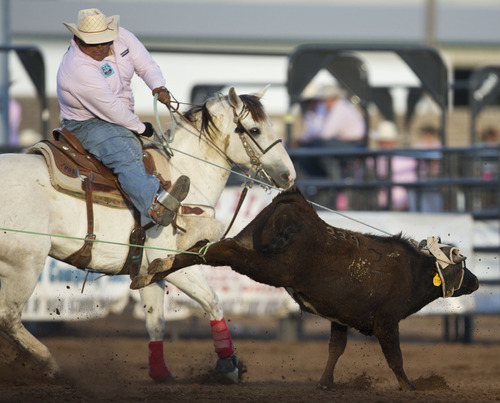 Rodeo • Spanish Fork senior lost a horse in car crash, then broke her back. 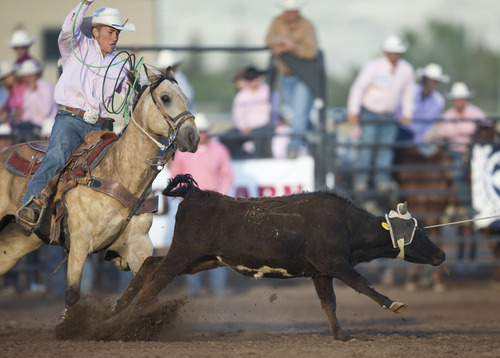 Lennie Mahler | The Salt Lake Tribune Cate Roberts scores a 7.99 with partner Cooper Larson to win the team roping event in the Utah High School Rodeo Championships in Heber City last week. 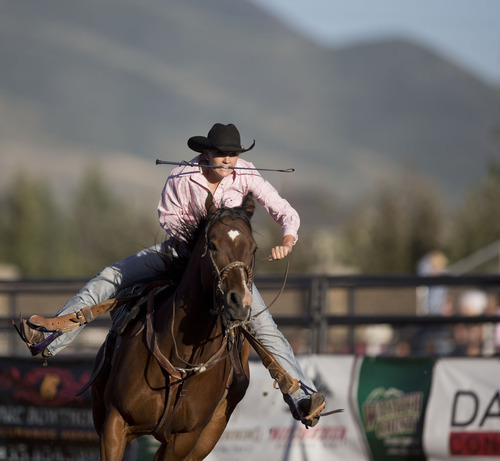 Lennie Mahler | The Salt Lake Tribune Cooper Larson scores a 7.99 with partner Cate Roberts to win the team roping event in the Utah High School Rodeo Championships in Heber City, Utah, Friday, June 14, 2013. 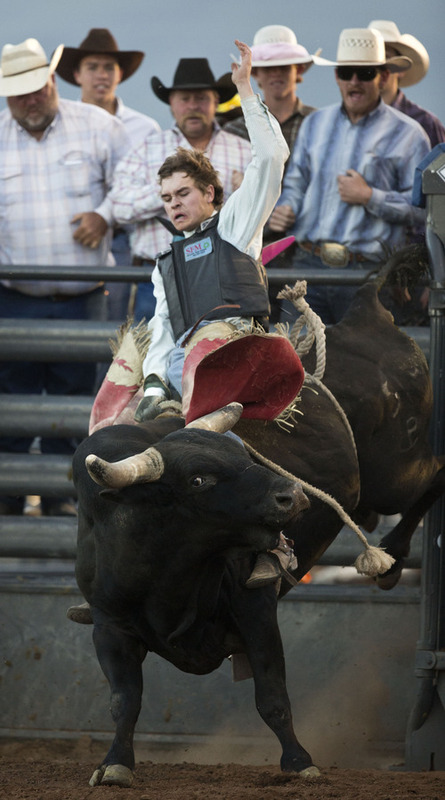 Lennie Mahler | The Salt Lake Tribune Dakota Ogden scores a 74 in bull riding to win the event in the Utah High School Rodeo Championships in Heber City, Utah, Friday, June 14, 2013. 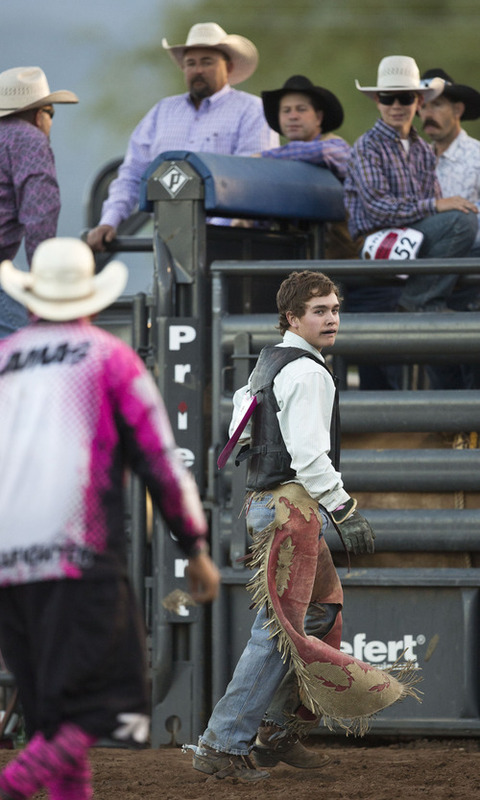 Lennie Mahler | The Salt Lake Tribune Dakota Ogden scores a 74 in bull riding to win the event in the Utah High School Rodeo Championships in Heber City, Utah, Friday, June 14, 2013. Lennie Mahler | The Salt Lake Tribune Cooper Larson scores a 7.99 with partner Cate Roberts to win the team roping event in the Utah High School Rodeo Championships in Heber City, Utah, Friday, June 14, 2013. 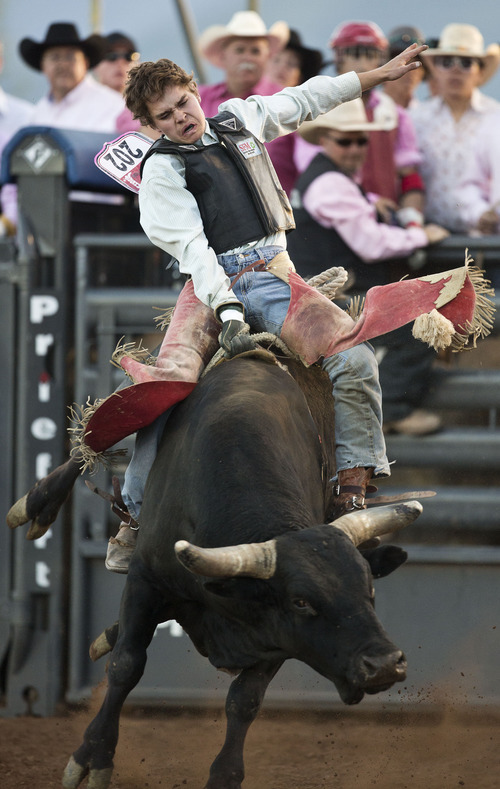 Lennie Mahler | The Salt Lake Tribune Dakota Ogden scores a 74 in bull riding to win the event in the Utah High School Rodeo Championships in Heber City, Utah, Friday, June 14, 2013. Lennie Mahler | The Salt Lake Tribune Taylor Rogers scores a 17.437 in the barrel racing event in the Utah High School Rodeo Championships in Heber City, Utah, Friday, June 14, 2013. 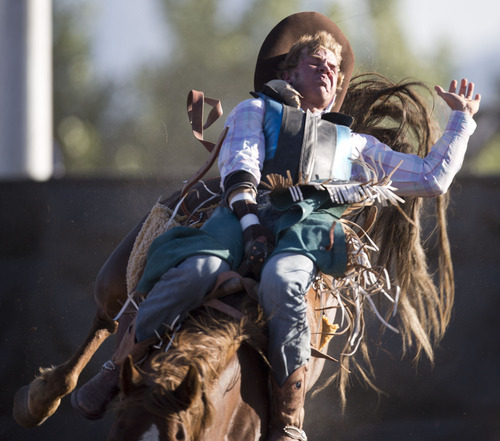 Lennie Mahler | The Salt Lake Tribune Alex Wright of Sanpete competes in saddle bronc riding in the Utah High School Rodeo Championships in Heber City, Utah, Friday, June 14, 2013. 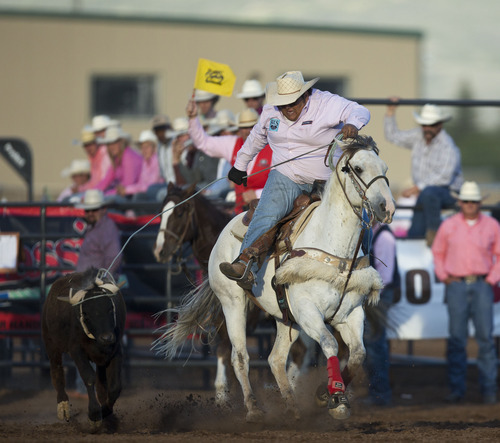 Lennie Mahler | The Salt Lake Tribune Colton Turner of Dixie scores a 52 in saddle bronc riding to win the event in the Utah High School Rodeo Championships in Heber City, Utah, Friday, June 14, 2013. Lennie Mahler | The Salt Lake Tribune Alexis Smith of Lehi scores a 17.129 in the barrel racing event in the Utah High School Rodeo Championships in Heber City, Utah, Friday, June 14, 2013. Lennie Mahler | The Salt Lake Tribune Lily Friar competes in the barrel racing event in the Utah High School Rodeo Championships in Heber City, Utah, Friday, June 14, 2013. 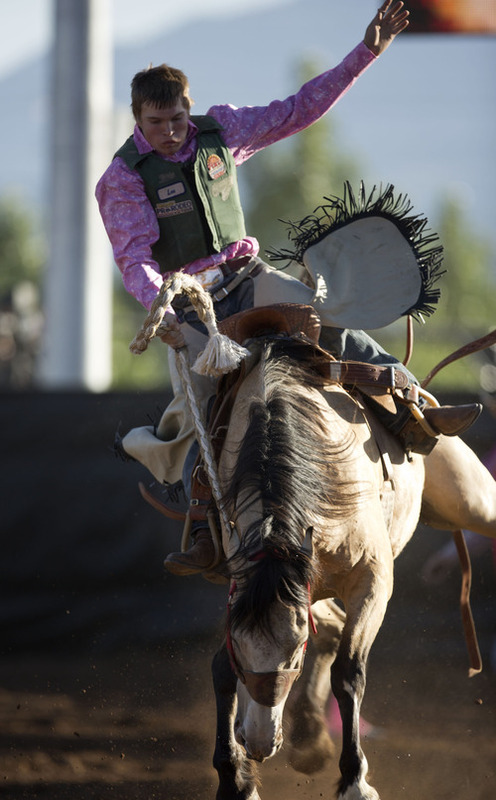 Lennie Mahler | The Salt Lake Tribune Alex Wright of Sanpete competes in saddle bronc riding in the Utah High School Rodeo Championships in Heber City, Utah, Friday, June 14, 2013. 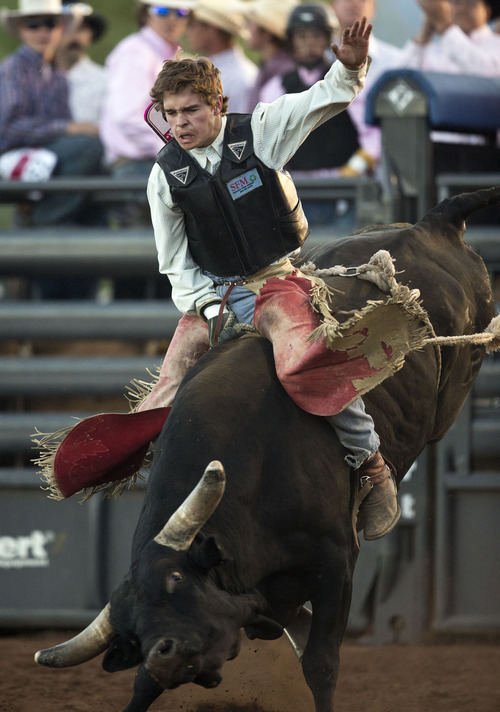 Lennie Mahler | The Salt Lake Tribune Dakota Ogden scores a 74 in bull riding to win the event in the Utah High School Rodeo Championships in Heber City, Utah, Friday, June 14, 2013. Lennie Mahler | The Salt Lake Tribune Shayla Giles scores a 17.177 in the barrel racing event in the Utah High School Rodeo Championships in Heber City, Utah, Friday, June 14, 2013. Lennie Mahler | The Salt Lake Tribune Alexis Smith of Lehi scores a 17.129 in the barrel racing event in the Utah High School Rodeo Championships in Heber City, Utah, Friday, June 14, 2013. Heber City • Savannah Pratt called her father, Casey, to let him know she was on her way home and would be there in about an hour. 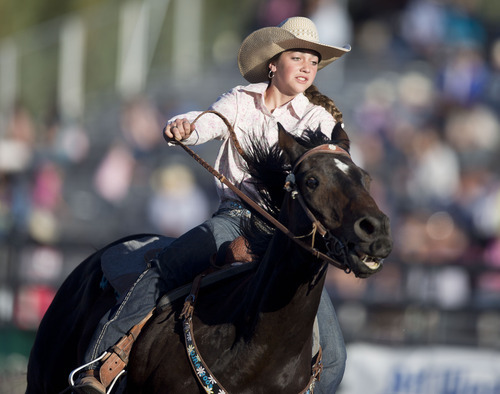 Savannah, in between her sophomore and junior year at the time, had just won the Silver State barrel racing championship in Nevada. She was on the freeway about an hour south of her home in Spanish Fork, alone in her truck with her two horses in the back of her trailer. The next call Casey received was from an unknown number telling him there was a bad wreck on the freeway. "My heart just dropped," Casey Pratt said. "He told me that she was OK. But to get there and see my daughter holding her horse, it was a bad deal." "This guy had been right by me for a while," Savannah said. "I was just coming down a curve and he must not have been paying attention, and instead of curving he just went straight and knocked me into the median." The truck with its human cargo was mostly unharmed, but the trailer with the horses had come unhitched and flipped on its side. Her roping horse survived but was cut badly all over its body. 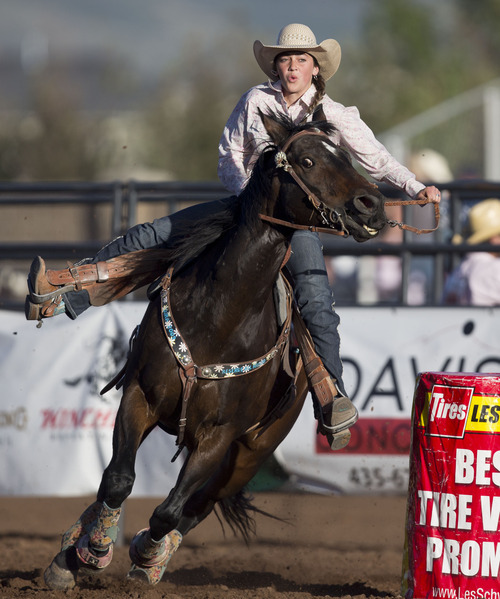 Her barrel racing horse, the one she had just ridden to victory, was dead. 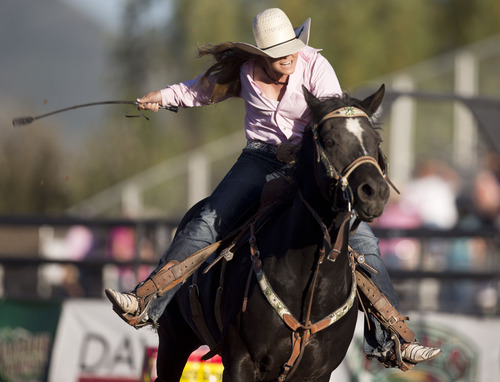 "I was super down and didn&apos;t want to rodeo anymore," Savannah said. But a few weeks later, a friend called and invited her to her home in Texas, where Savannah fell in love with a new barreling horse, Scooby. "I brought Scooby home, I loved him, and out of nowhere I was riding him the first night back at my house and he bucked me off," Savannah said. "I knew something was completely wrong. I tried to get up, and I couldn&apos;t."
It was August 16, 2011, less than three weeks after the car crash. "It was just a fluke deal," Casey said. "She hits the ground, and we didn&apos;t think nothing of it, but we get to the hospital and she has a bad break in her back." The doctor told Savannah she wouldn&apos;t be able to ride a horse again for a long time. She was confined to a wheelchair and wore a back brace for three months. 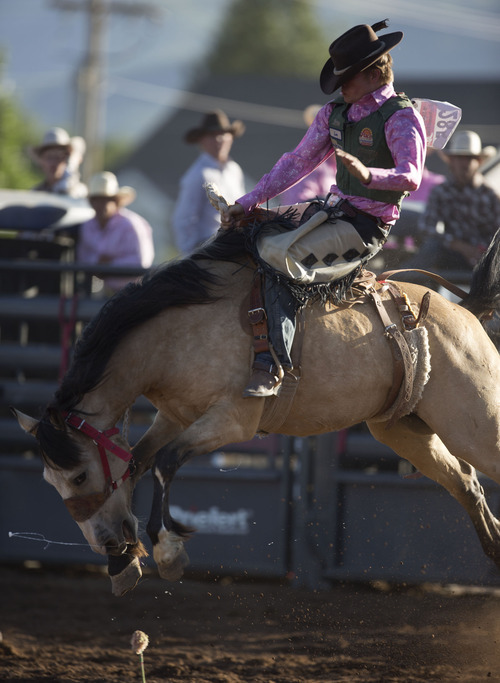 Her junior year was spent slowly recovering from her injury, but her senior year she rode in all 33 rodeos that were part of the Utah High School Rodeo Association season. 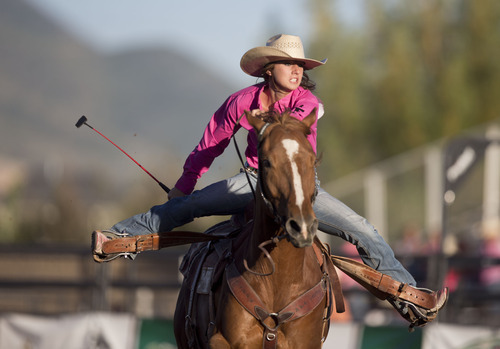 Now competing at the UHSRA state finals at the Wasatch County Fairgrounds, she heads into Saturday&apos;s final short round in third place in breakaway roping and looking strong to make it to the national finals next month. She also earned a full-ride scholarship to Utah Valley University, where she will attend class and ride rodeo this fall.